The new Twiggy Grid lamp by Foscarini on show at the impressively Baroque Palazzo Litta. It is officially a wrap. Milan Design Week is over for another year and the Salone Internazionale del Mobile and associated art installations, parties, talks and exhibitions have delivered tenfold. It was a year the Salone organisers called for the design industry to champion innovation and sustainability. With the help of the Space team, more space has gathered together a list of our top 18 in 2018 – all of our favourite chairs, tables, armchairs, beds, sofas and lights that rose to the challenge. Table Egeo designed by Jacopo Foggini for Edra. Following in the glass tradition of the Brasilia table designed by the Campana brothers and also for the Edra group, the Table Egeo has a top in thick glass – black or gold – with a faceted irregular perimeter. Its base is made from tubular steel with one central pedestal or legs and the series includes tops in different shapes. Like all of the designs in Edra's collection, this piece is pushing the envelope of manufacture. Ordinal is a sculptural set of contemporary dining tables that unites Michael Anastassiades' trademark metal work with Cassina’s carpentry craftsmanship. Made of solid natural wood, the table top contrasts with its sleek legs,.The idea for the Ordinal table started during a meeting between Michael Anastassiades and Cassina in 2010. The Cassina Research and Development Centre produced numerous techniques to ensure strength and stability without sacrificing its design. The result is an invisible metal mechanism that is inserted into the timber to support the large top and maintain a slender silhouette. Ordinal by Michael Anastassiades for Cassina. Designed by Oscar and Gabriele Buratti, Tethys is a suite of tables produced by Living Divani that are simple and refined. Their strength is in the form – the circle – and their appeal in the choice of materials. Made up of a series if cuircles, each element is designed to be combined. Tethys tables by Oscar and Gabriele Buratti for Living Divani. A project that fuses together different design references across the decades, Be Bop is described by the designers as an armchair that blends together multiple expressions in just one language. Be Bop is inspired by traditional timber stools found in Africa and then mixed with America's golden years of design. The hint of Ray and Charles Eames and their bentwood series is evident here. Be Bop chair by Ludovicca and Roberto Palomba for Kartell. The Back-Wing chair designed by Patricia Urquiola combines wood craftsmanship and the tactility of leather to create a chair with an undeniably architectural form. Made from solid, natural timber, the large section of the legs and the cross pieces of its construction highlight the form. In contrast, its slender seat upholstered in leather seems almost to have been placed on top, folding like a sheet of paper around the frame. The upholstery of Back-Wing has no visible stitching and the leather piping neatly traces the chair’s edge. 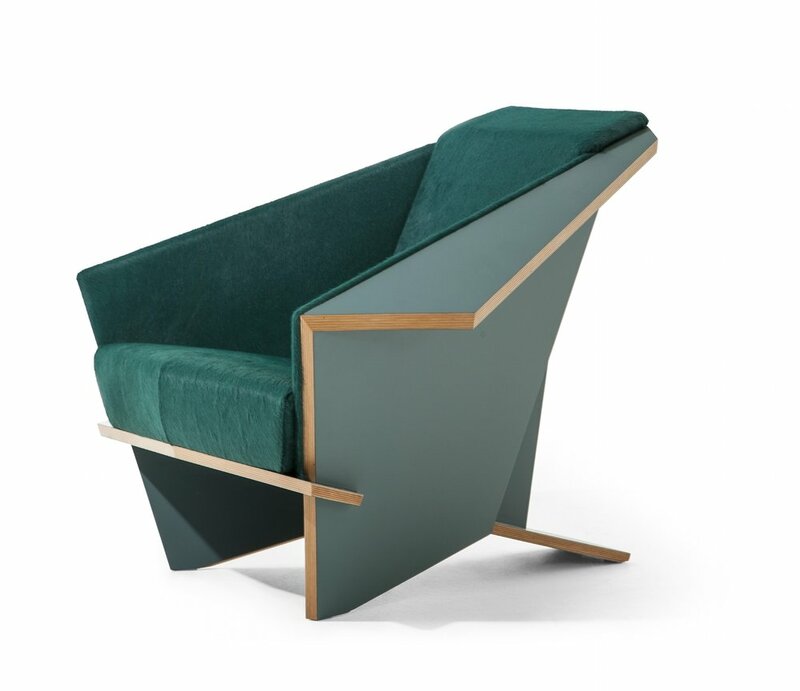 The Back-Wing chair by Patricia Urquiola for Cassina. The Generic range is described by Kartell as uncovering the "essence" of furniture design by stripping designs back to their origins. Generic for Venice is a tribute to Venice and the historic Harry's Bar. The armchair interprets the mood of the small and aristocratic Venetian bar with a faceted but light structure designed to support the body in comfort. A tribute to the famous Harry's Bar in Venice, the Generic for Venice chair by Philippe Starck for Kartell. The Bowy is a modular sofa with soft and welcoming curves that can be composed in a playful way. Designed by Cassina's art director Patricia Urquiola, the sofa's rounded armrest softly meets the backrest which then emerges beyond the seat units. Circular, semi-circular and rectangular shapes alternate dynamically to create a play of volumes and a graphic silhouette. The Bowy-Sofa is a ground sofa, almost monolithic, and is made up of individual modules with various types of backrests and seats (central, end, corner and chaise-longue) that have been conceived as sculptural pieces to be used alone or in a range of compositions. The curvaceous Bowy-Sofa by Patricia Urquiola for Cassina. Designed by Antonio Citterio, the Atoll sofa system is built on three basic platforms that are complemented by an armrest and backrest element to form various types of seats – sofas, dormeuses, corner-end modules, single or modular elements. The frames have light, slender lines, with high die-cast supports amd a metal profile to emphasise the line between the structure and the upholstery. Atoll by Antonio Citterio for B&B Italia. The Harbor series is added to this year with a new equally contemporary sinuous sofa. The result of Fukasawa’s research into seating typologies, this sofa is resolved in the shape of an upside-down truncated cone. The sofa reflects the architectural, ergonomic shape of the conversation armchair, compounding its welcoming appeal by accommodting two people. Made in fabric or leather, a visible metal zip is the sofa's only 'decorative' element. Harbor sofa by Naoto Fukasawa for B&B Italia. Hovering off the ground on two sculptural feet, the Floyd Hi sofa by Piero Lissoni has an armrest and back cushion that sit between the strict form of the sofa and the soft cushioned seat. The effect is a sofa that is both soft and structured at the same time, classic and hi-tech, in a play that is recognisably Lissoni. You can see this sofa adapting to the home and the office easily. The Floyd Hi sofa by Piero Lissoni for Living Divani. The Italian-Danish creative couple Gam Fratesi have developed thier own evolution of the eponymous armchair. The Kite Sofa has a compact outline with an elegant curve of tubular steel that forms the structure and encircles the internal padding. Described by the designers as resembling a "haute couture coat with a raised collar", it is a classic piece that channels Danish simplicity and Italian craftsmanship. The Kite sofa by Gam Fratesi for Porro. The dainty, slender metal legs of the Era sofa appear to magically support the contrasting seat. In a sort of challenge to gravity, it is a sofa that reveals all – including the craftsmanship and mastery that is required to achieve this level of refinement. The Era sofa by David Lopez Quincoces for Living Divani. The Hana armchair is designed by Simone Bonanni who started his career in the Marcel Wanders design studio in 2012. Now back in the Wanders' fold, the Hana armchair is a softly sculpted piece that wraps the body and itself in fabric. It is an armchair described by Moooi as "generous, cute and allowing for hours of lounging – to daydream, read a book and let imagination fly". Hana armchair by Simone Bonanni for Moooi. The first re-edition of the Taliesin 1 armchair was produced by Cassina between 1986 and 1990; it was part of the collection for only a short amount of time, perhaps because it was still seen as too avant-garde. Thirty years later Cassina has released a new version in association with the Frank Lloyd Wright Foundation. Manufactured in the company’s carpentry workshop, the armchair combines handcraftsmanship with the most advanced wood processing technologies. The project has been further developed thanks to the study of original drawings and the research and reconstruction work carried out by Cassina under the guidance of Professor Filippo Alison. Compared with the first edition various additional elements, such as the front feet, have been eliminated in order to place greater emphasis on its folds. The armchair is also more comfortable this time around, with thicker padding and a more reclined backrest. 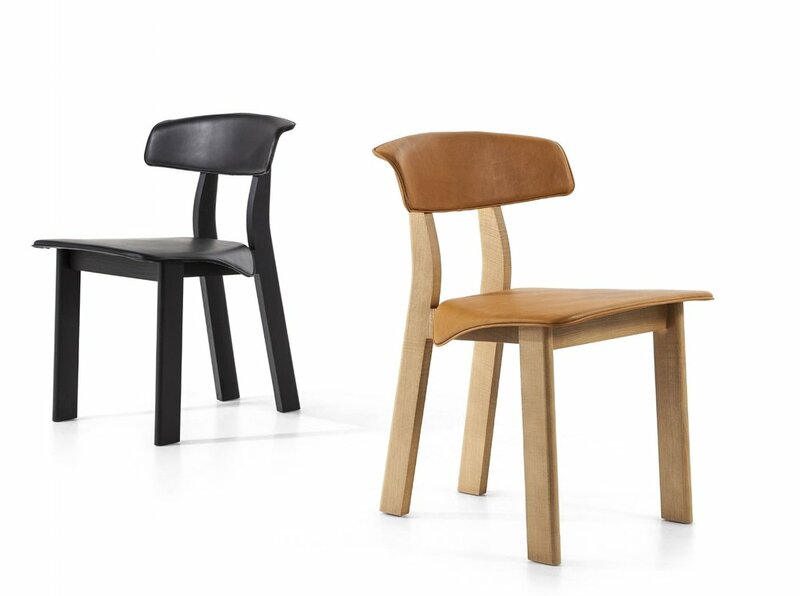 In addition to the historical version, Cassina has also produced a limited edition of 450 pieces – with the beech plywood structure, matt lacquer and a wooden profile, the internal upholstery is made in short hair leather in the same shade as the lacquer. There are a total of 150 in burgundy, 150 in petrol green and 150 in blue. The re-edition of the Taliesin 1 armchair by Frank Lloyd Wright, first desinged for Wright's own home in 1949, this chair is one of 150 limited edition pieces in petrol green. Chairs in two versions, armchairs, poufs and coffee tables, are the new proposals that extend the Caratos series launched last year. Maxalto's new items reflect and strengthen the original features while also softening them. The light die-cast graphite (or amber painted aluminium) structure is retained, and padded backrests contribute to the formation of the armrests. 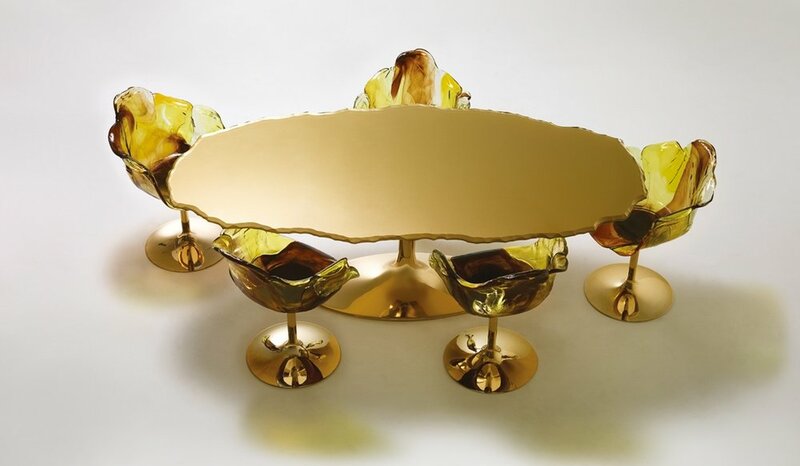 Caratos designed by Antonio Citterio for Maxalto. "The first sparkle of this idea was inspired by iconic, automotive headlights”, enthuses designer Bernhard Dessecker. First designed for the foyer of the Bavarian National Museum in Germany, the light’s oval design is modern with a classic twist. The familiar has been modified, creating a grand pendant light with a powerful impact. The light generates an ambient glow enhanced by bright rings of light wih numerous lenses and a constellation of LED lights. Iconic Eyes by Bernhard Dessecker for Moooi. Designed by Marc Sadler, the form of Twiggy is based on the bend of a fishing rod, This year's new addition to the family is Twiggy Grid that embodies the original desing's flexibility, clarity and strength. Now the shade is modified, with a woven surface that is both functional and aesthetic making it possible to screen the intensity of the light source while at the same time establishing a dialogue with its surroundings. Twiggy Grid by Marc Sadler for Foscarini. Edra and Francesco Binfaré celebrate 25 years of collaboration this year with the launch of the Stand by Me bed and the monograph, 'The Journey of Francesco Binfaré'. Described by Edra as "a bed so comfortable you might not ever want to get up from it”, Stand by Me has 'smart cushions' inserted into the headboard and soft padding all around. Materials are central to Edra’s collections and the group invests time and research into developing some of the most innovative and nuanced collections.